Where else can you get the possibility of a 7% yield these days? Once upon a time, investors seeking a reliable 7% yield from their investment could simply park their cash in a term deposit. These days, yields on those products are a shadow of their former selves, barely even keeping ahead of inflation. It is still possible however for investors to get that 7% yield - with the possibility of capital growth - from a diversified portfolio of quality Australian shares. Using strategies aimed at maximising the income of the portfolio, Perennial Value has a 12-year track record of delivering exactly that. 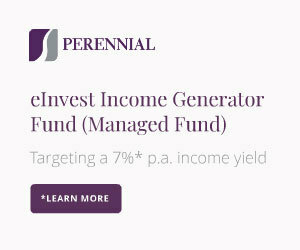 Today, we are happy to be able to make this fund more accessible to you via eInvest Income Generator Fund (Managed Fund). An Exchange Traded Managed Fund (ETMF) structure, which aims to pay a 7.0% annual gross distribution yield (comprising a 5% cash dividend yield, paid in monthly instalments, plus 2% franking credits).